(1) We posted a new article on our Management Page, Another Pay Cut for Pathology Practices and Laboratories, by Mick Raich, Vachette Pathology (click here). 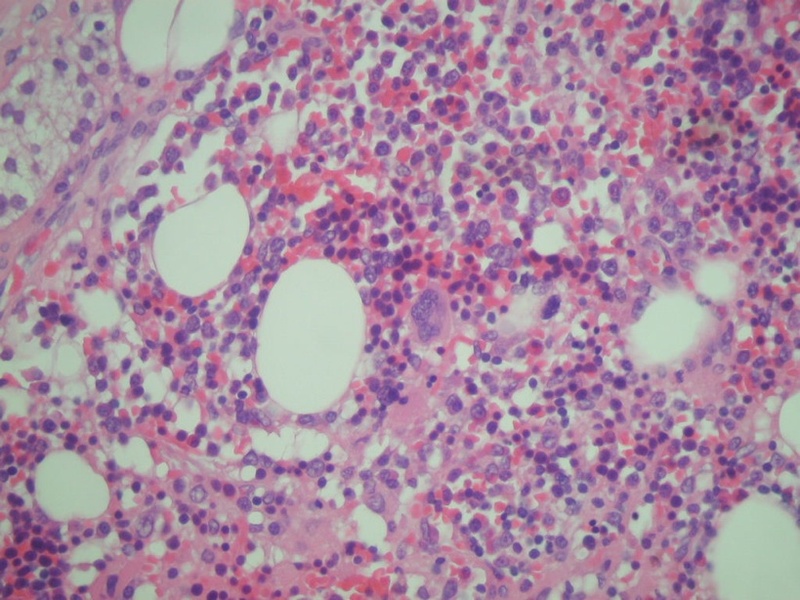 (2) We have updated the Acquired non-neoplastic anomalies section of the Bladder chapter. (3) We have updated the Staging sections for all chapters with information from AJCC Cancer Staging Manual (7th ed). 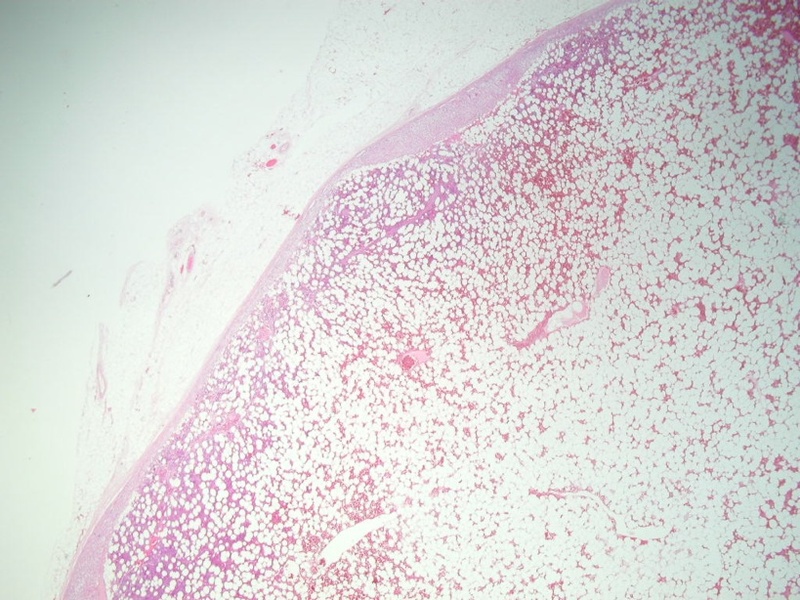 (a) Angel Fernandez-Flores, MD, PhD, Hospital El Bierzo & Clinica Ponferrada, Ponferrada, Spain - trichilemmal type keratinous cysts for the Skin tumor non-melanocytic chapter and warts for the Skin non-tumor chapter. (b) Andrea L. Wiens, D.O. and Janet E. Roepke, M.D., Ph.D, Ball Memorial Hospital, Muncie, Indiana (USA) - inflammatory cap polyposis for the Colon tumor chapter. 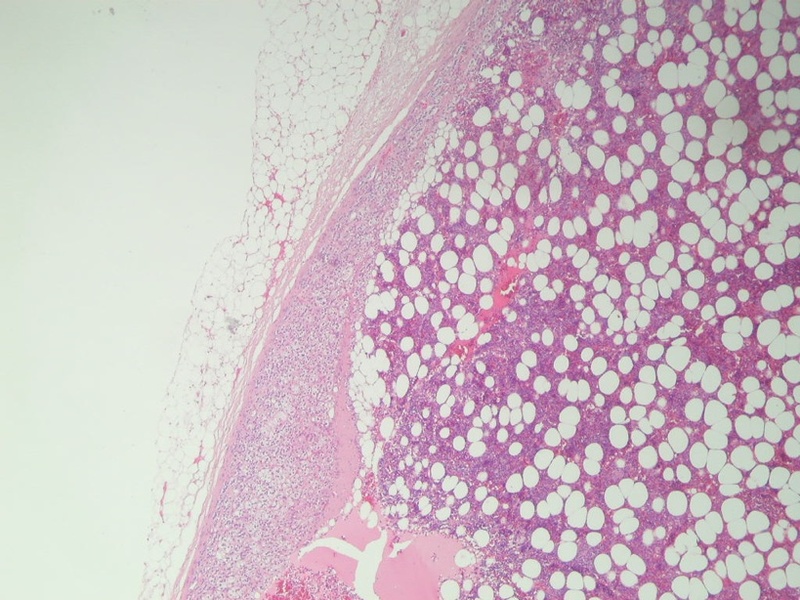 (c) Dr. Nadeem Zafar, Memphis, Tennessee (USA) - oxyphil adenoma for the Parathyroid gland chapter. Thanks to Dr. David Cohen, Herzliyah Medical Center, Israel, for contributing this case. To contribute a Case of the Week, follow the guidelines on our Case of the Week page. 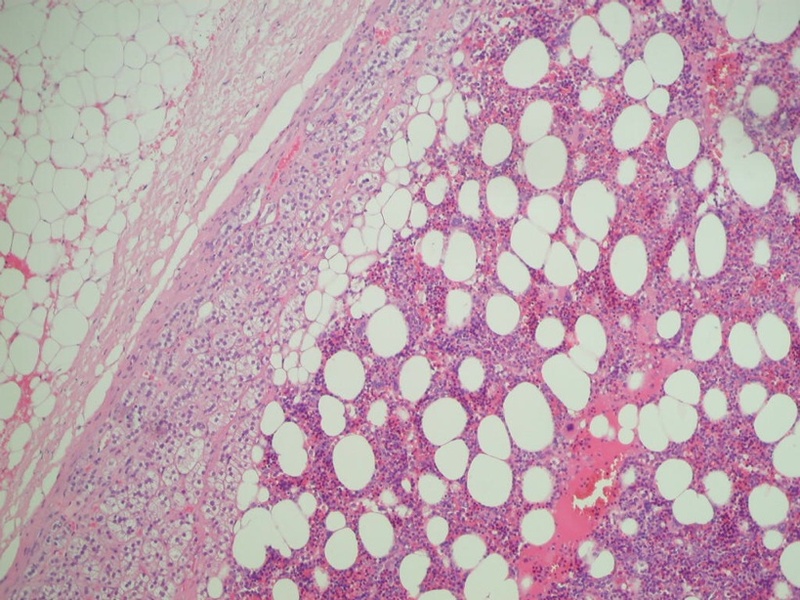 A 36 year old man presented with a right adrenal mass. 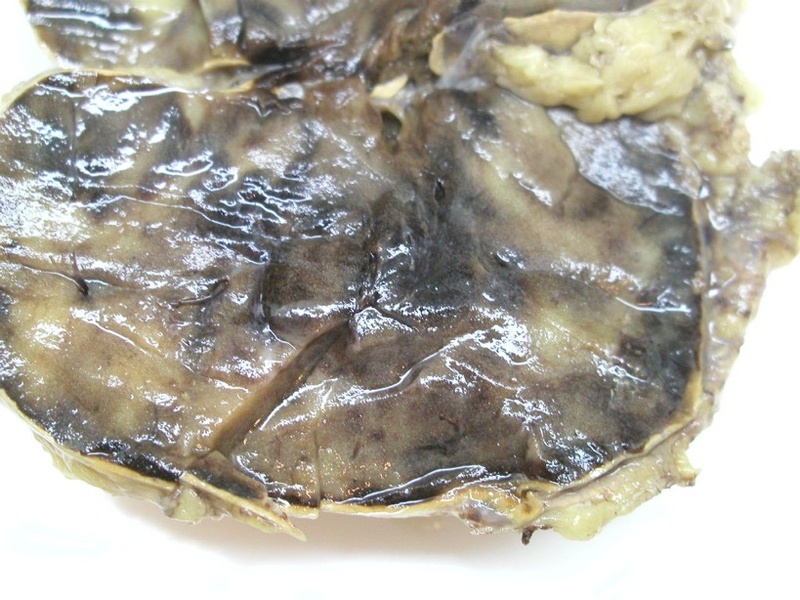 The specimen consisted of a tissue mass of 108 grams, measuring 10 x 6 x 5 cm, where the periphery was surrounded by a rim of fatty tissue. 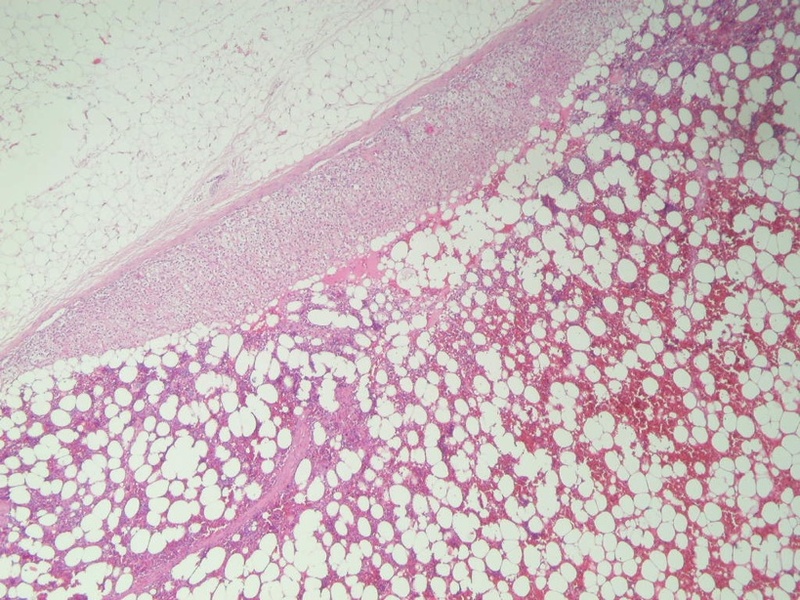 Sections showed a thin but essentially normal adrenal cortex at the periphery.� The medulla was replaced by a benign proliferation of mature adipocytes interspersed with vascular channels and fresh hemorrhage, most likely due to surgery.� The diagnostic finding was the presence of elements from all three hematopoietic cell lines. 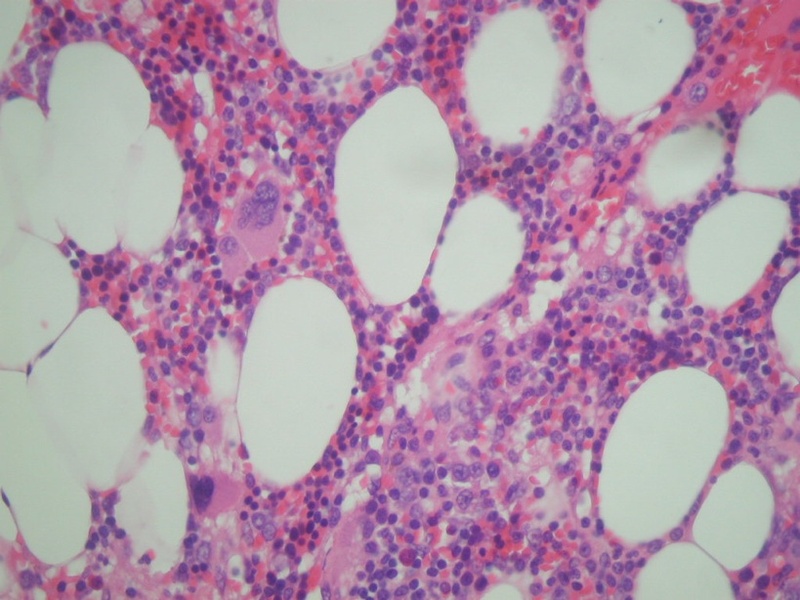 Myelolipomas are benign, usually asymptomatic and often incidental lesions typically found in the adrenal region.� Grossly, they vary from yellow to red to brown.� Microscopic sections show normal adrenal tissue combined with myeloid, erythroid and megakaryocytic forming cell lines (Mod Pathol 2007;20:405).� However, they differ from normal bone marrow due to increased frequency of megakaryocytes, reduced frequency of early myeloid precursors, and different vascular and stromal patterns (Am J Surg Pathol 2006;30:838).� These tumors may be neoplastic, as 80% have non-random X-chromosome inactivation. 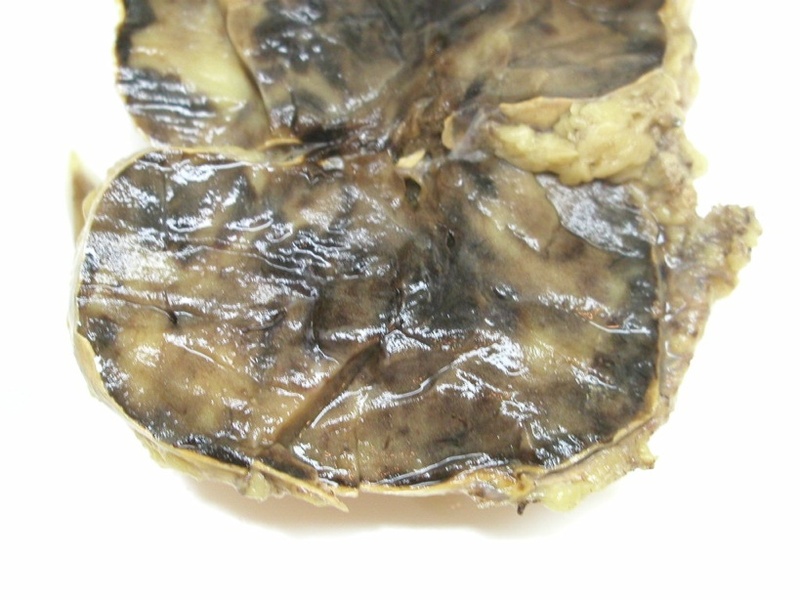 Excision may be necessary if the lesion is painful or presents other symptoms.� Large myelolipomas may cause local tissue necrosis, high blood pressure or hematuria.� There have been no reports of malignant transformation. 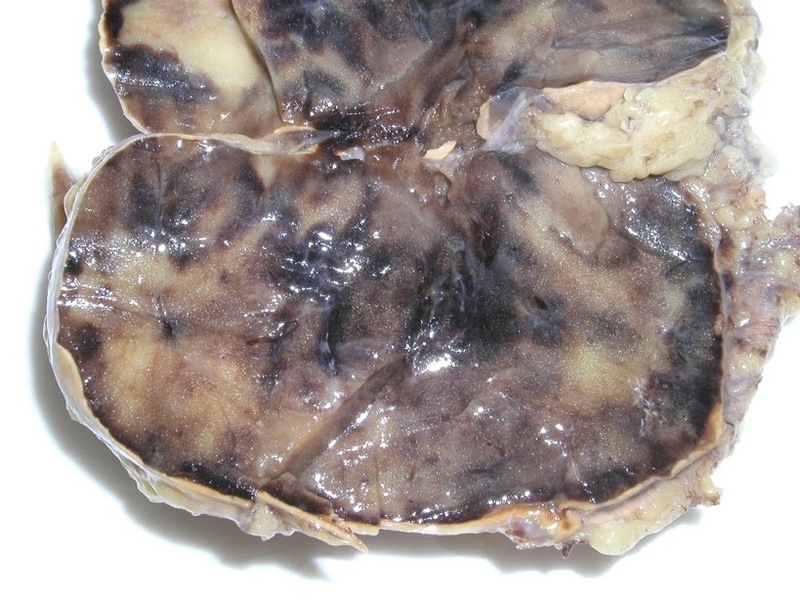 The differential diagnosis includes adrenal adenoma (no hematopoietic elements) and angiomyolipoma (prominent myoid and vascular component, no hematopoietic elements).� In addition, myelolipomas can coexist with other adrenal tumors (Arch Pathol Lab Med 2002;126:736).